Before our trip to France, we asked people about their favorite French restaurants in St. Louis and Brasserie by Niche made everyone’s lists. We finally made it there this week, taking Rick’s nephew, Phil, and his fiancée, Gabbi. The dressiness of the place was oversold on the review sites. Granted, it was a nasty winter night in St. Louis, so flannel shirts and boots were a practical necessity. But I think, on an ordinary night, you would still see guys in jeans and casual shirts and ladies only slightly dressier. Business casual is more than spiffy enough for a restaurant with checked tablecloths covered by brown butcher paper. The atmosphere is old world and warm — especially cozy in the winter. The reviews didn’t oversell the service. It’s practically magic — there when you want it and not when you don’t. That made for a very relaxed evening, wonderful for promoting conversation. A main topic of conversation, of course, was the food. We got very cheesy on the appetizers and ordered cheese puffs and a spreadable cheese with herbs on rounds of toasted French bread. They were two separate items on the menu but came out together, attractively plated on a large cutting board. 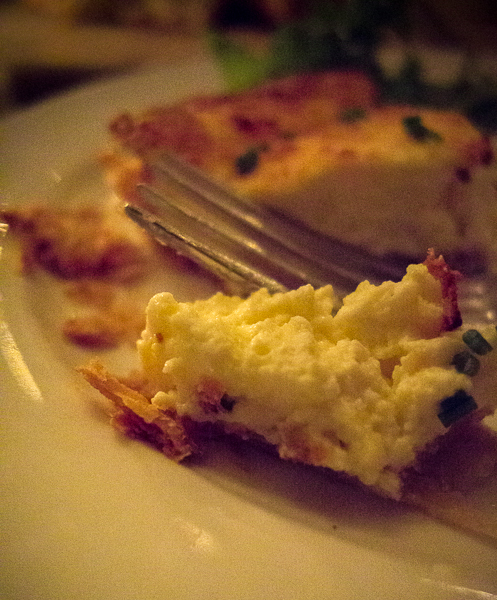 Rick and I agreed that of all the food we tasted, our favorite item of the night was the goat cheese tart with fresh fennel served as another appetizer. For a lighter meal, that tart and a soup or salad would be perfectly satisfying. This goat cheese tart served with some greens, including shaved fennel, was our pick for best item we tasted at Brasserie by Niche. A customer at a neighboring table heard us say this was our first visit to Brasserie by Niche. She said that one of us must order the roasted chicken. One of the reviews said the chicken was amazing, too. So, that’s what I ordered. It was good – tender and flavorful. But I can guess the secret: brining — which rendered it a bit too salty for me. Keep in mind that I bake my own bread in a bread machine because commercial bread has too much sodium, so I don’t have the normal American taste buds for salt. A half a chicken is way too large of a serving me, but I shared the leg quarter with everyone at the table and brought the breast home for sandwiches — which made for two tasty lunches! For dessert, after talking about the book Julia Child Rules by Karen Karbo, with Rule Number 10, Every Woman Should Have a Blowtorch, we ordered crème brûlée — so good that Gabbi intends to put a blowtorch on her wedding gift registry. 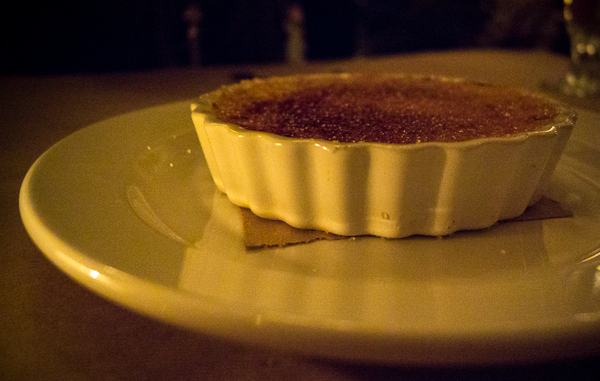 The crème brûlée at Brasserie by Niche came with a beautiful crust and a delicately creamy center — and four spoons. What is your favorite French restaurant outside of France? That reminded me to try some things out at home first, making sure that I got what I expected when I used different camera settings. I mostly relied on the automatic settings, but I switched between Program mode for wider shots and Aperture mode (with a setting of 2.8) for the close-ups. I made sure that the flash wouldn’t go off so as not to disturb other diners. I tested to see that the automatic settings made sense with night time interior lighting. My photos are grainy due to a high ISO, but I like that look. Also, I made sure that the battery was charged! I was pretty pleased with some of the shots, at least for presentation on the web, even though I took many fewer photos than I normally do when I’m shooting. Do you have any tips for taking good photographs of restaurant food? This is my post for both Weekend Cooking and Saturday Snapshot. Check out the Beth Fish Reads blog today for her foodie plans for 2014 and links to more Weekend Cooking posts. West Metro Mommy has snapshots of her children this week — cute, when you’re not the parent dealing with the unplanned paint job — along with links to more Saturday Snapshots around the web. Of course, this works as a Dreaming of France post, too. 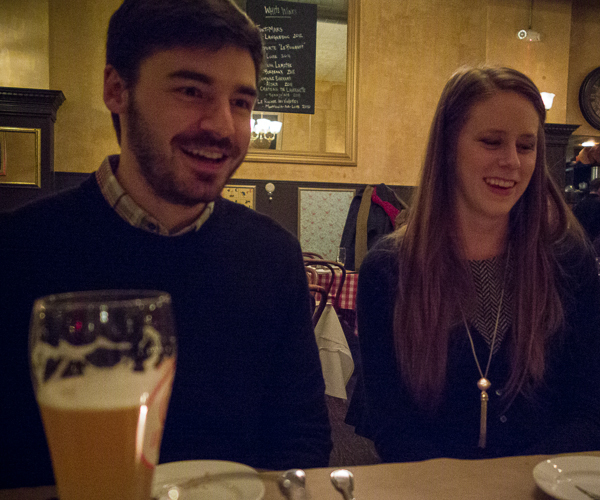 We talked a lot about France that night since Gabbi spent a semester abroad there. Sounds like a delicious evening! Oh, what tempting fare you have presented here! I try and do a bit of French cooking at home. The area I live isn’t very cosmopolitan and mostly I would rather cook the meals. A trip to France would be a great culinary adventure. That tart looks fabulous and now I’m hungry. Sounds like a great restaurant. I’d always order a goats cheese tart. I can’t believe that they served half a chicken! My husband lovely a brûlée, and while I like the creme layer I never really like the brûlée! I know. Still they always look great. And taking photos in restaurants is hard. The lighting is so variable. I think the main rule is to never use flash- that’s so awful for other diners. This sounds like a fun evening. THere is a French restaurant in Montreal that has a delicious duck dish. I must confess I am not a fan of creme brûlée. I like to play around with angles and perspective when taking food close-ups. much like your brulee pic. I’ve never turned down a good creme brulee! I’m a proud owner of a blow torch! Yum!!!! Sounds like a great evening and that the review sites were fairly accurate. We too have lost our taste for salt, so I know what you’re talking about.